All teams in every division play a minimum of five games (three on Saturday and two on Sunday). The top two or four teams (depending on time constraints) in each division will advance to the playoffs and a chance for a sixth game if you advance to the championship. Each game is four, 12-minute running quarters with five-minute halftime. We will make every effort to guarantee you are placed in a division vs. like competition. Team fee is $1600 per team. (plus applicable credit card fees). An $800.00 nonrefundable deposit per team is due before the registration deadline Friday, August 31, will hold the team’s spot in the tournament until Friday, October 6, 2017, at which time the balance of $800 is due. Once a division is full a wait list will be started. 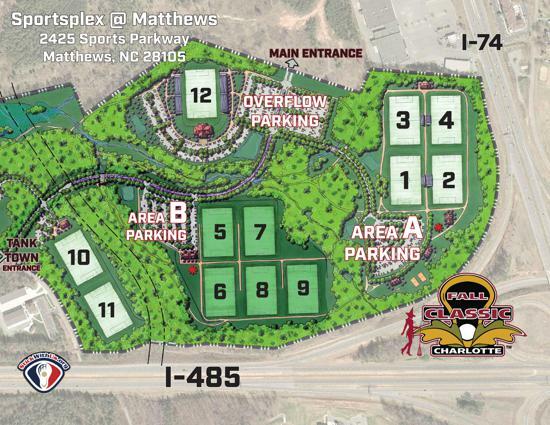 ALL games in ALL boys division played at the Matthews Sportsplex - 11 turf field at ONE location with plenty of parking. Best tourney venue in the southeast. Championship games played on the brand new stadium field! All games played on sports turf and all games guaranteed. Matthews SportsPlex - 11210 Brigman Rd, Matthews, NC 28105 at the Intersection of Brigman Rd - Tanktown Rd, Matthews, NC 28105 (Enter off of Brigman Rd - Behind the AMF Carolina Lanes) Map It!